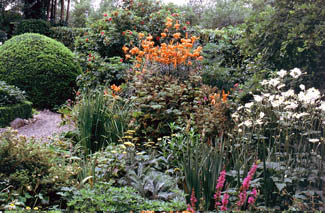 Series of contrasting gardens each beautifully conceived and wonderfully planted. 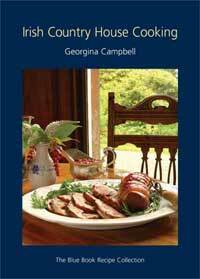 Patience has paid off for Frances and Iain MacDonald. 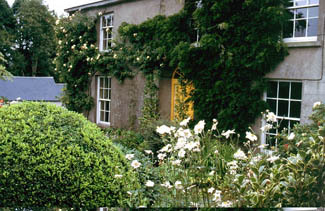 When they first bought their pretty Georgian farmhouse in 1989 the surrounding couple of acres was waist high with weeds and full of ash saplings. They cleared the site and grassed it to control the weeds before making new beds in 1992, spraying with weed killer three times, double digging, manuring and finally mulching around the new plants. Each time they opened a new area, they repeated the process. Now there isn’t a sign of a weed in the six stunning compartmentalised designs. Each offers a complete change of mood from the devilish excitement of the Hot Border to mesmeric swaying of ornamental grasses in the Barn Garden. 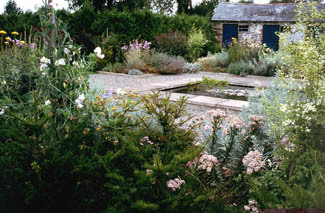 A place to admire individual plants, the Serpentine garden is laid out with wavy island beds where shrubs like the lovely Cornus alternifolia ‘Argentia’ and Parrottia persicaform the backbone, and smaller stars like Dierama igneumand Perovskia‘Blue Spire’ are the front row attractions. The deep bronze leaves of Vitis vinifera purperea that clothe the house together with the violet of C‘Perle d’Or’ are among the many happy plant associations. 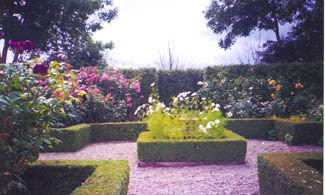 The soothing silver,white and blue planting around the pond garden, with plants like wormwood, campanula, and the perfumed seclusion of the rose garden, where shrub roses are screened by a hedge of Thuja plicataand restrained by a cruciform of meticulously clipped box, are a complete contrast to both the sinister black plants of the Funereal Border: Physocarpus opulifolius ‘Diabolo’, Pittisporum tenufolium ‘Nigricans’, and the jazzy reds and yellows of the hot border - here punchy crocosmias, dahlias and day lilies are offset by cool green foliage and sober plum foliage plants. 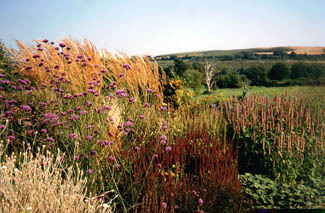 But the perhaps the real attention grabber is the Barn Garden; planted in prairie style, it exerts a great fascination: silky fronds and tassels of grasses like Calamagrostis‘Carl Foerster’ and ‘Overdam’, Stipa tenuissima and Miscanthus sinensis ‘Ferne Osten’ way in the breeze beside stately drifts of Sanguisorba‘Tanna’s Seedling’ and sedums. 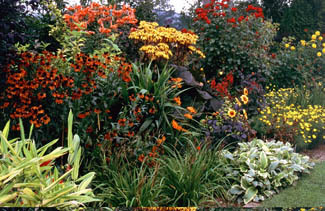 Almost everyone tends to pause on a welcome seat in the shelter of a parrotia hedge to drink in the effect before moving on to the newest area which, with its informal beds and specimen trees and shrubs, promises to mature into a good example of a low maintenance garden. And there will always be some intriguing new plan afoot - both the MacDonalds are qualified horticulturists, and their lives revolve around gardening, designing gardens, leading garden tours all over the world and propagating plants from the garden for sale in the nursery. Just off the main Dublin - Wexford N11 road, half a mile south of Camolin, towards Ferns.